FOLLOWING A STRING OF INJURIES, from torn calf muscles to back trouble to plantar fasciitis, blended thoroughly with several vein surgeries, it’s been a long, long time since I’ve been able to run. Last year, on the cusp of my 50th birthday, my body decided to show me who’d be in charge from now on. It wasn’t me. That has been the most frustrating part of midlife — discovering that the chassis will no longer tolerate the abuse it did in the first half. Not only will things break more easily, they’ll take twice as long to heal, if they heal at all. Time and time again, my body hammered home the point that there’s no rushing the healing process. It will take its own sweet time, and should you attempt to push your body faster than it’s willing and/or able to go, it’ll just break down somewhere else out of spite. I finally learned this lesson once and for all during my most recent bout with runner’s knee, that ironically didn’t even occur while running, but while spending a week helping The Cutest Man In The World move his belongings out of his three-story house. By the time we got back to California, all those trips up and down stairs had swollen my knee to the size of a grapefruit and I could barely limp, let alone walk. Run? Forget it. The doc said my knee needed six weeks without any aerobic impact to heal. “So,” I asked hopefully, “I can just jog a little or use the elliptical, right?” No, she said. No means no, as in none at all. Walking or swimming. That’s it. My knee was in agreement. Every time I tested that mandate, it rebelled mightily. So, I tried new — I did what I was told. Six weeks of no impact, and little by little, my knee healed. I tested it, jogged a teeny bit… no problems, no pain. Hallelujah, after long last, I could work my way up to running again! To celebrate my return to athletics, I ordered a pair of running shoes designed to hold my orthotics, and set out on Monday of this week to finally work back up to running. I was so good. I treated that knee like it was made of glass, running only on the graveled alleys, and only very gingerly. And it held up, as did my feet, my veins and my back. It was almost too good to be true. I came walking briskly down Third Street heading for the next alley, borderline euphoric that I’d feel normal and strong again before long, and suddenly my ankle twisted underneath me on the sidewalk. I had that awful, slow-motion sensation when you absolutely realize you’re going down and you also absolutely realize there’s nothing you can do to stop it. Luckily, my ankle pitched me toward the grass and not the pavement, but believe me, it stung. I got up, dusted myself off, and went back to see what sent me flying: a triangular piece of pavement, only about six inches long, missing from a corner of one of the sidewalk sections, but hidden from view by the raised block of pavement in front of it. I continued on my way with a scraped forearm, a sprained big toe and shoulder pain. Oh, and pain in one more place. Because you know what of course caught the brunt of the fall: my glass knee. Two steps up, five leaps back because, sadly, one of those steps landed in a hole in our decrepit sidewalks. I was, nonetheless, more angry than injured. I called City Hall later on and discovered that maintaining our sidewalks isn’t their job. 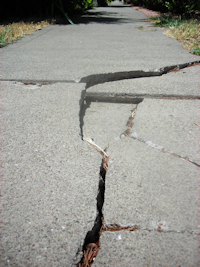 It is up to property owners to fix broken sidewalks. I asked the city manager and the redevelopment director how they city actually enforces sidewalk repair. The long answer: it doesn’t. The city manager said the only next step is litigation and pointed out that it’s not nice to go sue “poor little old ladies” to pay for sidewalk repairs they can’t afford. This answer was both unsatisfactory and glib. City staff informed me that, when push comes to shove, there are no teeth in the sidewalk repair laws in this town. The city shoves responsibility onto property owners, who can simply thumb their nose at the city and say “Make me.” “Make me” isn’t a useful sidewalk maintenance policy, particularly when you have no ability to do any making. TCMITW informed me that in his hometown back east, the city identifies squares of sidewalk that need repair, and then notifies the property owner that they must fix it within a certain time frame or else be slapped with a lien on the property. That’s pretty harsh, but here’s the softer side: property owners have the option of allowing the city to make the repair at a substantially lower price than a private contractor would charge. Most homeowners opt for this easy and affordable city-sponsored repair system, and when there are enough work orders, the city goes through and makes the repairs all in one sweep. I mentioned all this to the city manager, and his answer was that homeowners are already grumbling about having to pay for water meters. Once again, this wasn’t a satisfactory or logical answer. Somewhere between litigation and non-sequiturs, there’s got to be a way to get our sidewalks repaired. Most of our broken sidewalks are within the boundaries of the city’s redevelopment area. Redevelopment funds may be used to repair blight, and nothing says blight like crumbling, cracked sidewalks, yet the city seems reluctant to spend redevelopment funds on sidewalk repair. I realize that we needed bollards much more than sidewalks, however, we could have both. If the city doesn’t want to spend redevelopment funds outright on the sidewalks, it could at least use the funds to implement a low-interest loan program for a repair system like the one TCMITW described. Eventually, the city would get those funds back. It seems to me that if we have money to pay for designing logos, we have money to loan for sidewalk repair. Maybe a reexamination of our priorities is in order.